ooooh. look at those great creative treasures. i would use those in a heartbeat. i am heading out to michigan with a few girlfriends to scrap today. can't wait. 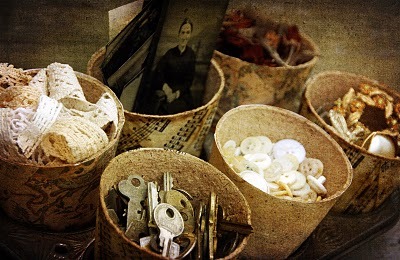 Beautiful photo...love those cups full of keys and buttons!! thanks for the creative well wishes, tomorrow is slated for much needed studio time, woohoo! I really like the cups that hold your ephemera, did you decorate them yourself?